Citizen Bridge was envisioned to be a temporary floating pedestrian bridge for passage between Brooklyn and Governors Island. Inspired by Walt Whitman’s report of farmers once walking their cows across Buttermilk Channel at low tide, the project aimed to reclaim the waterfront step by step, as New Yorkers gain agency over their bodies in relation to the water, a necessity after the destabilizing effects and future threats of catastrophic weather events. It was intended to challenge governing forces and open up new vistas for the occupation of public space, while demonstrating the potential of large-scale cooperative building with a simple modular design. To succeed where other bridge projects have failed, by building a structure at the scale of its use value. To create a situated and fully embodied experience of a New York City waterway in order to deepen the citizen relationship to its waterfront. To rekindle the citizen imagination of physical engagement in the city. Hydrostatic Lift (When a House Becomes A Boat) presented a documentary of Citizen Bridge through the archive of its aggregated email communication. Comprised of research queries, outreach, scheduling, document distribution and exchange, design collaboration and legal counsel emails, this sculptural work narrated the past 4 years and 4 months of the daily work of building a bridge, from scratch, as an artist and private citizen harnessing expertise and knowledge towards this goal. 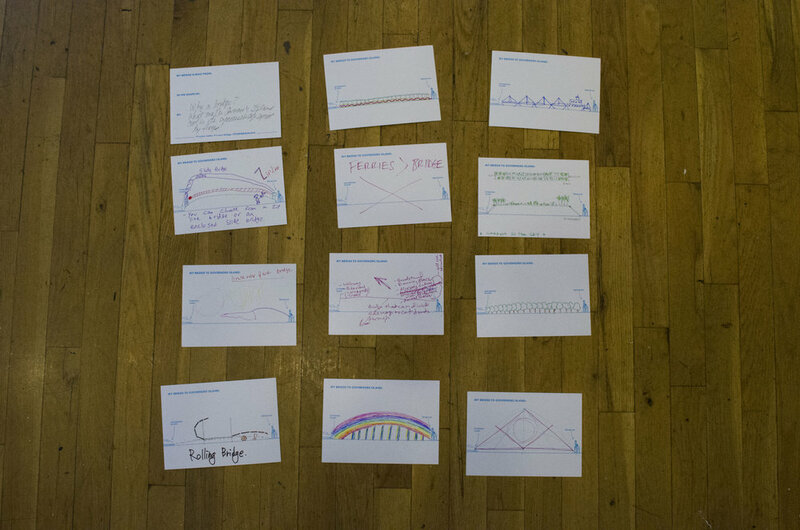 Nancy also had an interactive component which invited people to draw their own ideas of what a bridge to Governors Island could look like. Nancy Nowacek is an artist whose work is rooted in the ecology of the everyday: the processes, codes, and habits of life. Her practice is focused on the uses of the body as relates to work, architecture and the practice of space. She has shown in New York, the Bay Area, Los Angeles, Canada and Europe. Nowacek is a visiting critic at Pratt and NYU, and has an MFA in Social Practice from California College of Arts. She is certified in personal training by the National Academy of Sports Medicine and lives in Brooklyn.